Five Parliamentarians of the Jathika Nidahas Peramuna (JNP), led by former Minister Wimal Weerawansa, have informed the speaker, in writing, that they will be leaving the Constitutional Assembly. 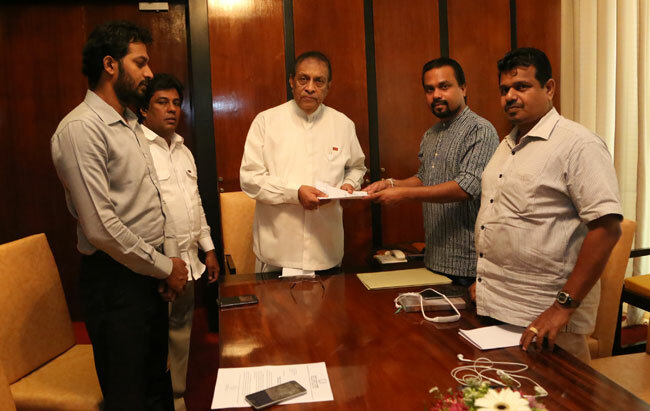 The five parliamentarians who were elected in to parliament while contesting under the United People’s Freedom Alliance (UPFA) from the JNP, also known as the National Freedom Front (NFF), handed in their letter of departure to the speaker of the Parliament, Karu Jayasuriya today (19). The parliamentarians who will be departing include ; JNP leader Wimal Weerawansa, Jayantha Samaraweera, Weerakumara Dissanayake, Niroshan Premaratne and Padma Udhaya Shantha Gunasekera. In their letter to the Speaker, they had highlighted ten reasons as to why a decision was made to leave the Constitutional Assembly.